In an ongoing series, David Heymann explores the charged relationship between buildings and sites. Seminole Canyon State Park sits on tableland between the in-flowing Devils and Pecos Rivers, about 150 miles down the Rio Grande from Big Bend. This area, once forested grassland, was the epicenter of a cliff dwelling culture that flourished from perhaps 13,500 to 5,000 years ago. Overgrazed in the 19th and 20th centuries, it is today desert along the U.S./Mexico border. So you can easily make out the exposed Visitor Center, and even at a distance the building and its scar tissue generate a disappointing landscape, neither direct nor refined nor ruthless nor poetic nor minimal nor exuberant nor picturesque nor systematic. Up close the construction is only a little better. A curving stone-clad wall — part of a perfect circle — hides the utilitarian box into which the program is shoehorned, with the public spaces diagrammed into the space between the curve and the box. Budgets for these kinds of buildings are spare. You can imagine the architect having to fight for just that little gesture! There’s actually a second construction visible in the aerial photograph of the site. Under the overhang in the foreground is one of the larger cliff dwellings in the area. All those millennia ago a particular conspiracy of environmental variables controlled which promising cliffs were appropriated for inhabitation. Here the curve of the stone bluff faces south-southeast, forming a solar bowl. In winter, when the sun’s arc across the sky is tight and low, the vertical rock surfaces under the overhang absorb the sun’s radiation to the greatest extent possible. As the air temperature drops on winter nights the cliff re-releases this stored heat, warming the shelter. In summer the same configuration and orientation keeps the direct sun — now tracing a broad, high arc — out almost entirely, and the dwelling is cooler than its exposed surroundings. Better yet, prevailing warm weather breezes from the south-southeast strike the cliff head-on, while winter storms out of the northwest shunt over its shoulder. The year-round stream that carved the cliff obviously provided water, but it also protected the inhabitants from marauders. The abruptness of the cliff helped with protection too, though it served another deadly purpose. Buffalo, driven over the lip by fires set on the mesa, plunged to their fate in the stream below, where they were readily butchered. Hides were cured on the streamside limestone boulders that, in dislodging, formed the overhang. Over time these boulders became impregnated with fat, and still today they look slathered in lard. The actual construction of the cliff dwelling rises from these buttery boulders to the underside of the overhang: a vast (mostly man-made) pile of rocks, dirt, organic matter, ash, flint cherts, and other detritus that formed a dry and habitable platform. This building, which negotiated between the existing topography of the site and the necessary topography of use, is known as the Fate Bell Shelter. It seems frequently the case at such constructions that environmental factors and site disposition work together so precisely to support human inhabitation that only powerful forces could be accountable. Is it surprising that in the shelter we see, painted on the walls and underside of the overhang, the fading and now fragmentary remains of enigmatic pictographs, often containing life-sized shamanistic figures, for which this ancient culture is noted? 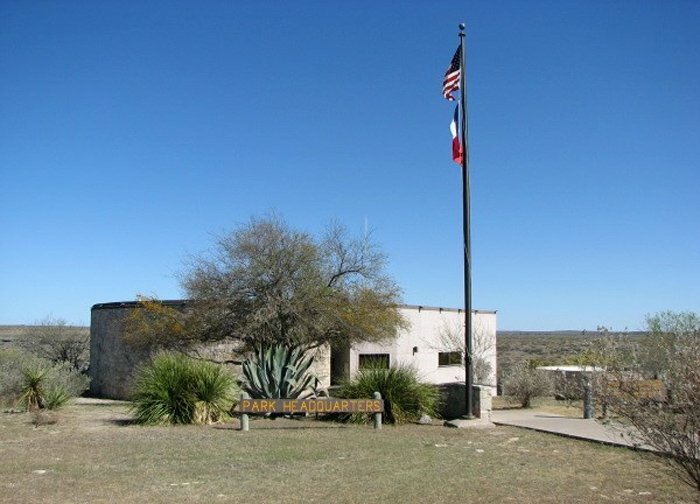 The Seminole Canyon Visitor Center and the Fate Bell Shelter are examples of extremes of a certain critical manner by which constructions can be conceived with regard to location, specifically the degree to which a construction registers kinship with its site. We perceive that the Visitor Center is brought to its site, which serves as its setting. The Fate Bell Shelter in turn seems drawn from its site, which serves as its source. Though architects today frequently use some version of the phrase from the site, one’s perception of certain qualities inherent in the built object is actually the key. What architects today more or less mean is the overt formal evidence of site response. It may well be that the Visitor Center is technically well-adapted to site realities. But one’s sense, looking at the object in its setting, is that the building arises from hermetic design issues: functional efficiency, Cartesian geometry, and the marketplace economics of its method and means of construction. To a certain degree ­­— you sense this in the materials used, the nature of the openings, the Platonic curve — the design of the Visitor’s Center also seems to recognize syntactic desires about appearance specific to discussions within architecture as a cultural activity. This is the same as saying it is concerned with style, understood as a noun. On the other hand, at the Fate Bell Shelter under the cliff, style seems first and foremost a verb: to construct, to form, to shape. This doesn’t necessarily mean the Visitor Center is objectionable in its landscape. But, by way of contrast, the Shelter — its purpose, its materials, the unintelligible geometry of its form — could not be imagined without the fact of its site. Of course it’s entirely possible to bring a hermetic object to a site and erase that sense of to, as any of the villas of Palladio proves. I do not mean to cast either of these ways of thinking as a better way to make buildings. There will always be, at various moments in most culture’s trajectories, distinct preferences for to the site or from the site as loosely defined here. In some eras (the Renaissance, the Modern), site is, despite the inevitable exceptions, generally of secondary importance, as other factors — ritual, function, technology, material — become more pressing in determining a building’s meaningfulness and form. In other periods site is of the utmost importance in explicitly determining the form of a construction, and other factors arise from or adjust to what a site demands. In an earlier essay in this series, I argued that site has lately — in the after-Modern — evolved from a being a setting for architectural meaning to being its very source. Given that argument, my sense is that most people visiting Seminole Canyon will prefer the landscape made by the Fate Bell Shelter to that made by the box of the Visitor Center. Here’s an odd test of that claim. Consider these two landscapes created (though not at the same time) by the Belgian Surrealist Rene Magritte. Each painting depicts, in the same older site, the consequence of a new construction — a painting on an easel depicting what is already there, in one; a sphere, in the other — though only one seems to bring it forward in time. On the assumption that landscapes will change as a consequence of the arrival of new constructions, which do you prefer as a method of change? René Magritte, The Fair Captive, 1931. René Magritte, The Monumental Shadow, 1932. I think today most observers — though not necessarily most innovative architects, on which more later — would prefer the landscape made by the canvas in the canvas (the from the site solution) to that made by the sphere (the to the site solution). Perhaps it’s just the lowering sky, but the sphere sure is sinister: yes, nothing escapes change! Its presence recalls a long confident history of disrespect for local possibility — note it has displaced a mature tree — that is the hallmark of a now dated Western desire for progress, in which improved meant more or less that a construction was striving to be superior to circumstance, especially site circumstance. As at the 1939 World’s Fair, in New York, the sphere in the Magritte is brought to the site — Progress! — over which construction and desire thus have the stronger voice. In the painting you can clearly see how to the site, as a design strategy, demotes the status of site from source to setting. Arguably the landscape remade by the painting on its easel represents the preferred alternative today. Here the consequence of the inevitable change to what will be doesn’t seem to undermine what was. The faithful canvas re-presents without interpretation or willfulness, or so at least we suspect. It’s like finding a cloud on a lake. Here change is a conceptual policy about form’s responsibility to site: the least disruption of something we seek to keep intact. You can see the same impulse at work in Future System’s earth-sheltered house in Wales, or at Maya Lin’s Vietnam Veterans Memorial, or at MVRDV’s Glass Farm in Schijndel in The Netherlands; you can see it also in the designation of a historic district, a view shed ordinance, or a nature preserve. In all these instances, it is site that has the strong voice, recasting desire and limiting form. We see the same in the Magritte, in which most of the evident construction — that is, the painted canvas depicted within the painting — has been drawn from the site in a literal mapping (the easel and the canvas edge are merely necessary minimal infrastructure). It would seem self-evident that any culture relying on site as a primary source for meaningfulness in design will prefer from the site as a design strategy. Imagine having to present those two Magrittes as alternative design proposals to the building committee of that small French town, regardless of which you prefer! Almost any new building today provokes a crisis in landscape. The question is always: is it enough about its site? One thing though. Despite the seeming disregard, Magritte’s sphere is carefully considered for its site. There is, after all, a reason Magritte chose to show the same landscape so altered. The difficult compelling success of the sphere’s landscape is predicated on complex relationships, noted above, between the oversize pearl and the viscera of the site. But who today has the patience for that kind of problematic theorizing about progress? The issue is simpler. The sphere just isn’t doing enough to show it cares! There are obvious difficulties in using these Magritte paintings, and the Visitor Center and Fate Bell Shelter at Seminole Canyon, as means to discuss a construction’s relationship with its context. All of their sites — real or imagined — seem relatively straightforward, and their constructions seem lucidly direct or pleasingly obscure. But the more complex a constructed landscape gets — as in any modern marketplace city — and the less direct the relationship is between the building’s function and its specific location — a particular quality of such cities — the more confusing things get. Yet the from the site impulse remains. Here is a useful example: the Schaulager, in Basel, by the architects Herzog & de Meuron. The mass of this building, an unusual mix of art museum and art storage, is determined by the envelope allowed within the setbacks and height restrictions of the site’s zoning limitations. Such limitations share something with the solar arcs of Fate Bell, though they have an obvious arbitrariness, since zoning envelopes evolve circumstantially over time, while the course of the sun remains a fixed annual pattern (at least in human time). This is a good example of an interesting recent phenomenon: architects granting the arbitrary physical restrictions of the urban world the same status as natural laws. The Schaulager’s exterior is clad in concrete panels for which the loose gravel recovered during excavation of the lot notoriously serves as an exposed aggregate, much as the mass of the Fate Bell platform is the direct byproduct of available materials. It’s a great impulsive idea, yet its consequence, like that of mapping its zoning envelope, does not exactly result in a landscape that has the powerful legibility of Fate Bell. The Schaulager’s presence is intriguing — confusingly so. Our understanding of it in landscape is theoretically based on a compelling possibility: that a building might arise from its landscape procedurally, rather than from some visual norm. Were the makers of the Fate Bell shelter concerned with its appearance? Probably not. They were concerned with its occurrence. This concern the Schaulager seems to share. It purports also to be the consequence of available means, not pre-imagined ends — not style but styled. We are meant to perceive in the fact of the building this quality of almost authorless automatic-ness (an obsession with this firm), and the directness of the approach should theoretically generate a sense of consistency to its landscape. It’s an interesting argument. Architects who use it — and many use it — will often introduce such designs with the term “inevitable” (though, to be fair, Herzog & de Meuron do not seem to do this). By which they usually mean: not willfully composed. Actually, this is intellectually misleading, and borders on nonsense. A design process may focus on means rather than ends, but that does not guarantee its products are unconcerned with appearance. Still, you often hear architects claim that since the designed object arose from a process — from style as a verb — its appearance plays no role in its meaning: that it is style-less. This seems to be a troubling false hangover of the Modern. You may, for example, have been taught (certainly I was) that a Jackson Pollock painting was about the act of painting, since its appearance is the direct byproduct of the means of production — paint being flung at canvas — rather than the enactment of a pre-imagined visual end. But, aside from the likelihood that Pollock was beginning these works with very loose figure drawings, you will not, to be sure, ever see all the paintings Pollock made, just the ones in which the actual result was in line with what was desired. That is, you will only see what Pollock felt were the Pollocks. That’s true for the Schaulager as well. Herzog & de Meuron are notorious for making hundreds of study models — each may register a slightly different authorless control — until they hit the one that resonates most richly on a certain level of presence (about which more later). Constructions like the Schaulager may seem to be about means, but let’s please be honest about this: ends still rule. In this regard, the Schaulager is akin to Pollock’s Convergence, and both are not at all like the Fate Bell Shelter, which probably is just the byproduct of its making. The Fate Bell Shelter is Modern like a John Deere tractor or a Colt revolver: anonymous and urgent, and therefore beautiful in its homeliness. These are precisely the qualities desired for the presence of the Schaulager, even if this presence is not an indwelling genetic condition of this institution as a facet of landscape. But there is no revolver-ness to the Schaulager’s purpose, as there is to getting a dwelling platform above a stream’s flood stage. No, the issue is the appearance of urgency, which is, at its heart, still a question of appearance. It would be intellectually naive to claim otherwise. The Fate Bell Shelter’s makers were likely not concerned with its appearance; but appearance is very much a factor in buildings designed by architects, even if they deny it by correctly claiming that appearance arises indirectly, as a byproduct of process. It may do so, but by choosing among many similarly generated options, appearance comes right back into the picture. Style — as in style, the noun — is not an unwanted guest one can bar at the door. It’s simply an unwanted member of the family unfortunately in possession of a master key, that always slips into the party, invited or not. Mayne is here using an unusual and limited definition of context (frenetic energy and toughness) to imply broad contextual responsibility, as if these qualities alone — let’s just toss out every other imaginable factor — were the only requirement to secure you membership in some mythic Lower East Side gang! In an earlier essay in this series, I suggested a dark purpose for this sort of intentional misleading in discussing the Seattle Public Library: to snake-oil-sell a difficult building into place in a time of meekness. But even if there’s something well meant in what Mayne says, for an article targeted at architects, this usage of contextual is insulting. It limits the role a landscape plays in design to whatever you need to justify the thing you want. Mayne’s building is ambitious, and I’m sympathetic. But, let’s face it, he’s even grasping about toughness. His beautiful building is about as tough as a dancer in West Side Story, all gang-gestures in ballet shoes. You want tough? Try Marcel Bruer’s Whitney, uptown in the refined brownstone neighborhood of the Upper East Side. It’s an unapologetic neighbor, equal parts libertarian and psychopath, lurking in its moat and glaring at you through its baleful cyclopic eye (it has more of these, like a spider, on its side) while making threatening gestures in bush-hammered concrete. So what are we to make of that Morphosis building? Is it derived primarily from the site, just myopically? Or is it a construction, like the Whitney, brought to the site, but, unlike the Whitney, excused into place? The latter initially seems more likely. If architects are interested in landscape today, you can be sure the people paying for buildings — and the people approving the construction of buildings — are interested in landscape today. And you can also be sure their definition of fitting into landscape will be more limited than the finer possibilities architectural discourse would propose. Above all, you can be certain their definition will not include this possibility (even though history supports it): sometimes the richest landscape is made with a construction that makes no overt reference to its site. There’s a hard argument to make right now, at least in the United States. Unlike Breuer’s day, it’s a tough time to sell spheres as progress. The Whitney tried three times to expand into the brownstone landscape from its original construction. It tried conservative (Graves), and not conservative (OMA), and something in between (Piano), to no avail. The neighborhood inhabitants’ understanding of appropriate has hardened to a literal concern for scale, material, and historical decorum, not ineffable qualities like energy and toughness. They will not be fooled again (and so the Whitney has moved away). Nor will most people, even for an architect as convincing and smart as Mayne. So when we hear Mayne suggesting that his Cooper Union building is trafficking in the from the site tactics of Magritte’s painting-within-a-painting, while in fact its presence is more like that to the site sphere, either he’s just bluffing, or some new paradigm is coming into being. OMA, proposal for Convention and Exhibition Center, Ras Al-Khaimah, United Arab Emirates. And, actually, it may well be. There are parts of the world — Asia and Europe in particular — where architects are still able to sell to the site as the best thing for a landscape, as in a recent convention and exhibition center proposed by OMA for a new city in the United Arab Emirates. How can that be? How can it be that in a time of a desire for from the site, spheres — well, they aren’t exactly spheres — are what architects still propose? How can such to the site entities ever be understood as from the site? Clearly these categories, which seem simple enough on the surface, are more complex, troubling, and intertwined than one would at first suspect. “A Building, Not a Colt Revolver” is part of a series of articles drawn from Landscape with Buildings: Essays on Site Design, a work in progress by David Heymann. Joann Gonchar, “41 Cooper Square,” Architectural Record, November 2009. An analysis of the very different ways in which works of sculpture and works of architecture occupy the landscape. David Heymann is a columnist for Places. He is an architect, and the Harwell Hamilton Harris Regents Professor in Architecture at the University of Texas, Austin.